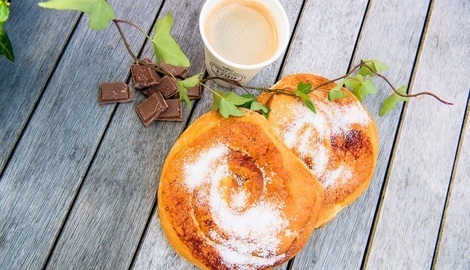 Warm yourself with a hot cup of coffee and freshly baked goods in Fløistuen Shop & Café, enjoy something to drink while you admire the stunning view from Fløien Folkerestaurant or take a hike to Brushytten! Welcome to Fløistuen Shop and Fløistuen Café close to the upper station of Fløibanen funicular. 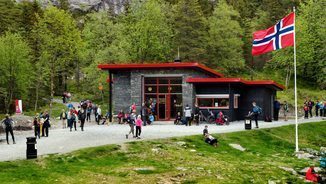 At Fløibanen’s upper station – 320 meters above sea level – you will find Fløien Folkerestaurant, elevated high above regular daily life in the noisy city below. 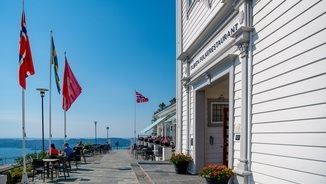 Fløien Folkerestaurant is a café, an á la carte restaurant and also hosts special occasions with its spectacular view. 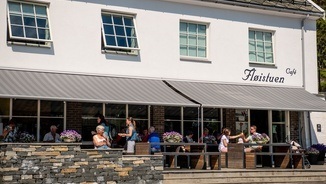 For many families with children, a trip to Brushytten is a popular Sunday adventure. Here you can enjoy a break before you go back home or continue on a longer hike.